Back in 2017, Russell Westbrook became the first player since Oscar Robertson to average a triple-double for the season. The next season, he set the a new record, averaging a triple-double in back-to-back seasons. He’s now the only player in NBA history with multiple triple-double seasons. This season, Westbrook set another triple-double record. He’s now the leader for most consecutive triple-doubles. He got his 10th straight triple-double earlier today against the Portland Trail Blazers, passing Wilt Chamberlain who had nine straight in 1968. He finished the game with 21 points, 14 rebounds and 11 assists. Westbrook needed to lead a rally in the fourth quarter to get his record. He entered the final period with 18 points and 11 rebounds but only had five assists. His assist flurry in the fourth quarter also led the Thunder to pull away from the Trail Blazers. He got his ninth assist on a Deounte Burton layup to push OKC’s lead up to 14. Nearly a minute later, Westbrook fed George on a pick-and-pop three-pointer to get his 10th dime. Paul George wasn’t so bad in this game too. He also had a triple-double, but it was his explosive scoring that got everyone’s attention. George dropped 17 points in the first quarter against the Blazers. He added 30 points in the next three quarters. 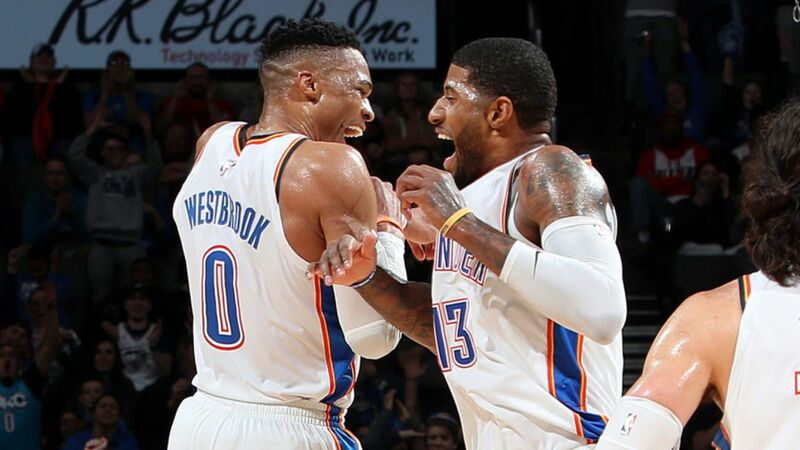 George and Westbrook are playing out of their minds. That’s why the Thunder have won 11 of their last 12 games. Let’s take a look at the two during that stretch. Westbrook is currently averaging 21.2 points, 11.1 rebounds and 11.2 assists. If he continues this monster stretch, he might set another triple-double record by the end of the season. The bigger thing though is if both can continue their winning ways. If that happens OKC is looking at a torrid run deep into the Playoffs. Westbrook wasn’t the only one who had to rally to keep his streak alive. James Harden came into this game with 29 straight 30-point games. Against the Mavericks, that streak was in danger. Harden was experiencing some shoulder pain today and that limited him. He wasn’t his usual high-scoring self, tallying only 11 points in the first half. With 2:38 left in the game, Harden only had 22 points to his name and the Rockets were only leading by nine. That was until he shrugged off his injury to knock down three treys to put the game away. Harden scored his 29th, 30th and 31st point of the night on a long three-pointer from the left wing, keeping the streak alive. His final nine points of the game were all tough, contested three-pointers with a guy practically in his jersey. But Harden still drilled them anyway. Harden now joins Chamberlain as the only players with 30 consecutive 30-point games. Chamberlain holds the record with 65. Late in the game, the Nets suddenly caught fire from beyond the arc. They came back from six points down behind back-to-back treys from Allen Crabbe (assisted by D’Angelo Russell). The Nets then took the lead as Russell drained his own three-pointer with under a minute left in the game. Danny Green tied the game with a trey and the Raptors were able to force a miss on the other end. They ran down the clock and got the ball into Kawhi Leonard’s hands. Leonard nailed a tough fade away jumper that banked in, killing Brooklyn’s chance to win the game. Leonard finished with 30 points and eight assists to lead the Raptors. This game was also Marc Gasol’s first game with his new team. He had 16 points off the bench, including 10 points in the pivotal fourth quarter.